Hi. Finally feeling better today! 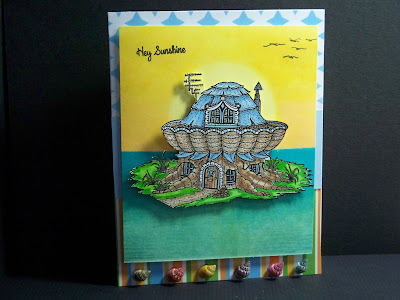 Today's card is a Mushroom Lane stamp from Cornish Heritage Farms (www.cornishheritagefarms.com) and when I saw it, I pictured it as an island! So that's how I did it. The little seashell embellishments are a gift from my friend Cathy in Arizona for my B-Day, thanks friend, love them and they were perfect for this card! I'll send you the original card. Have company from Toronto this weekend, so glad to have them with us. Bye for now. I would love to feature you on my site tomorrow! I just love your stuff! Thanks for sharing -- Much Love -- I opened my new site -- Beelicious blog designs - the button is on my main page. I never thought of it as an island but it really works. Beautifully coloured and I love the sun in the background! It's Sheron Pearl, Cathy from AZ has been keeping me posted on your cards when I see her at the club meetings. Your work as always is just absolutely beautiful. I have found a store here that is giving stampscape lesson and have been taking them and I do think of you since you were the first to introduce me to them. Miss all of you and Buffalo Stamps and Stuff.